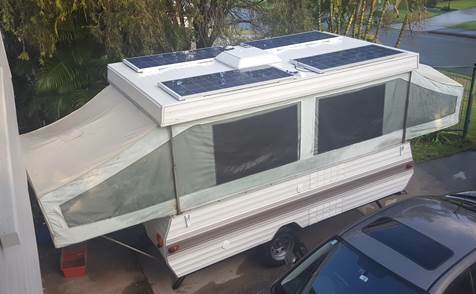 During the Resto of my 1983 JaySwan, I decided to remove the old Gas system and convert the Camper to run purely off of the batteries or Mains power when available. To do this, I removed all of the old gas lines and all of the old electrical components including wiring, lights and 3 way Fridge. When it came down to working out what I needed, I started from the top and worked my way down. 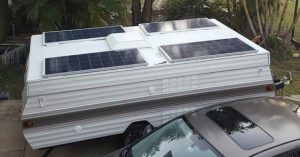 Solar: Well that’s easy, these days it’s relatively cheap so I put as much as I could up there so I would still have some charging on those bad days or in case part of the camper was in the shade. I opted for 4 x 150w Enerdrive Panels. That’s 600w as this seemed to be the best fit for the available roof space. 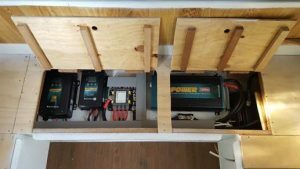 I paralleled wired the panels on each side and then ran both sets of cables to under the kitchen bench via twin 10mm² solar cable to a stud point, then twin 16mm² from there to the solar controller. The rest of the power setup. 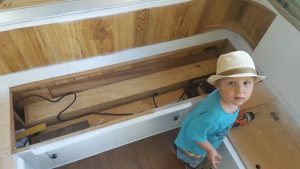 Now the best way to do a power setup is to allot yourself some room in a cupboard or under a seat. 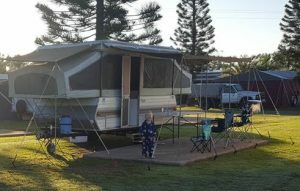 I chose to lay the gear down under the lounge at the front as it gave me plenty of room and I could also open the front sliding doors for extra ventilation if needed. My young apprentice was able to give me a hand with the install, Thanks Ash. Once I work out how much room I had, it was time to work out how to fit it all in. I found it easier to put all the equipment on a board cut to size and pre-wire most of it on the bench. 1. To save your back & 2. It’s just easier and allot neater. For the power system I decided to go with the Enerdrive gear as it was the most flexible when it came to battery type and programmability for the price. This also meant that I could keep all the gear the same brand with the same charging profiles and if I had any trouble it was one call for it all. AC Charger – ePOWER 40A – the 40A is great if you have loads running while charging as it has plenty of amps to go around, it will also run off a 1kva generator. DC2DC/Solar – ePOWER DC2DC 30A unit – the DC2DC is almost a necessity these day with most late model car’s running with the computer controlled variable voltage alternators – AKA – Smart Alternator (still to be determined). It also has a solar input for when the engine is not on. These units are rated at around 500w of solar up to 45VOC but since being a true MPPT you can overdrive them with solar wattage and since you don’t get full output out of panels lying flat on your roof most of the day, over driving to 600W is pretty well matched for my system and also saved me having to buy another controller. 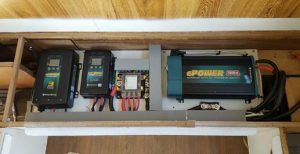 Inverter 12VDC to 230VAC – ePOWER 2000w with RCD & Transfer switch – Again since the camper was over 30 years old and I decide to remove all the old Gas lines, Stove/cooktop and the old inefficient 3 way fridge an inverter was a must. Instead of paying big money for a new 12v RV fridge, new oven and someone to re plumb everything, I decide to convert it all to 230VAC. I bought a fridge from the Good Guys with a 3 year warranty (which I read the manual before buying and saw it even said suited for caravans) and a 900w Microwave. with 2000w available, this will also give me the ability to run any other appliances I want like a toasted sandwich maker or coffee machine or the wife’s hair dryer. Fusing – Blue Sea Safety hub 150 – I chose the Safety Hub 150 as it’s a quality, all in one solution that can handle heavy loads like the inverter and battery chargers as it uses MIDI fuses for the large loads and still has 6 x ATO (AKA- Blade) fuses for the lighter loads. Battery Monitoring – For the Monitor I went with the Enerdrive ePRO battery monitor (the eLITE would have been just as good) but for the extra couple of bucks, I got the history and time remaining feature. Battery – Due to the fact I wanted to run the inverter for things like the Microwave, Toaster and Coffee machine in the morning when the batteries are normally at their lowest and I didn’t want to add a big bank of AGMs for this factor, I decided to fit the Enerdrive B-TEC 200Ah 12v Battery. The B-TEC can supply the full current needed to run the inverter at 2000w and only weighs 25KG. It also has a Built in BMS and Battery monitor so I didn’t really need to fit the ePRO Battery Monitor (But I already had it so I’m keeping it). All the equipment (excluding wiring & the board I mounted it on) weighed in at 85kg and has a RRP of $7,911.00 or $7,511.00 if you didn’t worry about the ePRO Meter as the B-TEC has it built in (but a necessity with AGM Batteries) Don’t forget you can always work out a package deal with someone. This might seem like allot of money, but when you think that all up the Camper has cost around $14K (including the Power System with 200Ah B-TEC Lithium) it’s not a bad setup considering I have enough power to run just about anything I would want to and not having to worry about connecting to mains power, giving me the freedom to find and stay at some of the best spots around the country and do it in comfort. Photo: Laying out equipment to work out the best fit. Photo: working out where to put cable ducting. Photo: Started to run all the wires and connect the equipment up together (Notice cable sizing to get the best out of the system). Photo: installing the equipment board under the lounge. 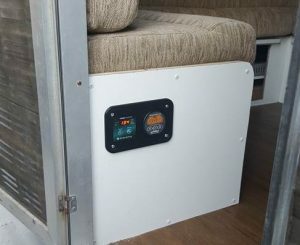 Photo: I designed and 3D printed a custom Panel to put my Inverter and Battery monitor in near the Door for easy access. On our 3rd Trip away and now with a 3yo & new born on board, we haven’t gone off the beaten track too hard yet but still haven’t needed to plug into power. Having the freedom with the Enerdrive system allowed me to run my 240v fridge, Cook my toast in a real toaster, boil the kettle in no time instead of using a gas burner and warmup some leftovers from the BBQ the night before in the Microwave. Even with running all this I still was recharged by lunch, giving me peace of mind that I will have enough power to go away for extended periods without mains power and some bad weather.